As our tour guide said: “Everywhere else in the world, the day before Ash Wednesday is called ‘Tuesday’. Here in New Orleans, we call it ‘Mardi Gras’”. 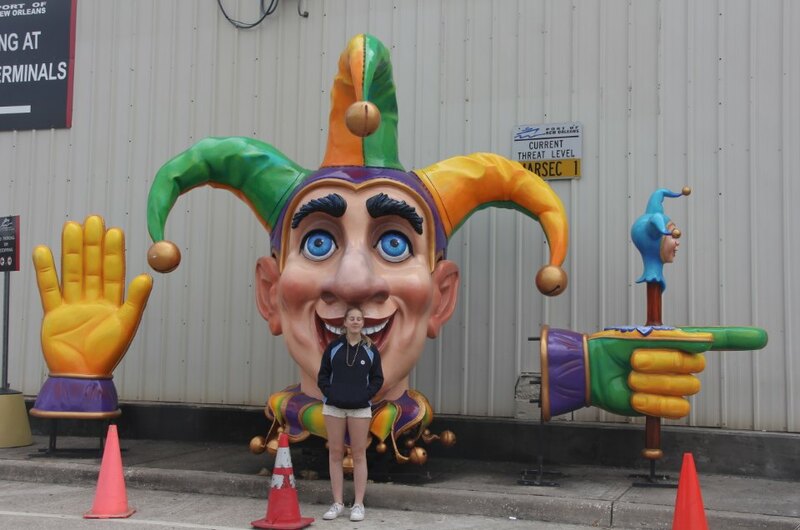 We were touring a Mardi Gras (or ‘Fat Tuesday’) workshop, where they build floats and parades all year round. 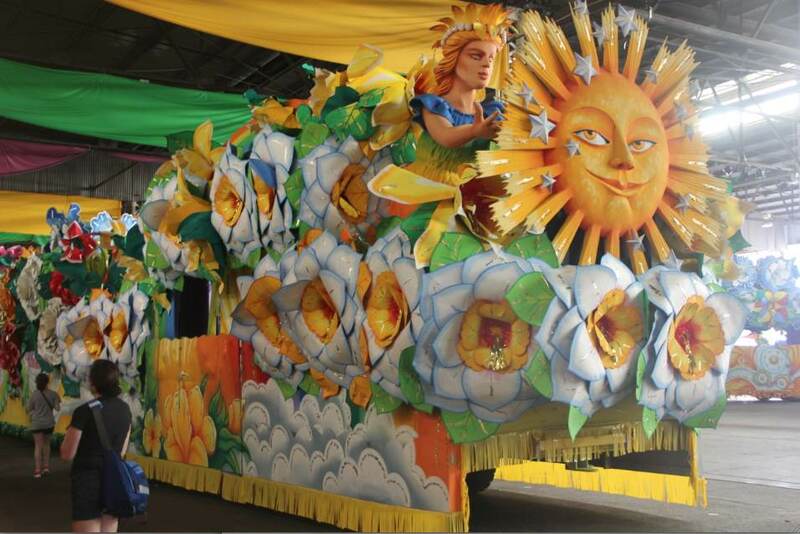 Just one of Orpheus’s floats (Orpheus is a krewe). Orpheus’s signature is flowers. The year’s theme was “The Magic of Every Day”. There’s no corporate sponsorship or product placement in Mardi Gras. All the funding for the parades comes from private clubs, or krewes. 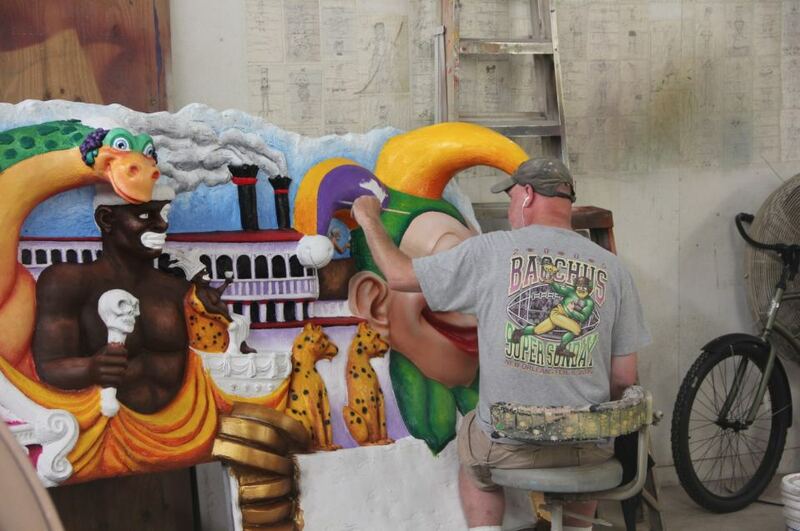 A krewe has 500 – 2,000 members, depending on the number of floats it can afford to display in its parade. The minimum number of floats that a krewe must show in its parade is 14, but many krewes have 30. A basic, single-trailer float costs $60-80,000 to buy. 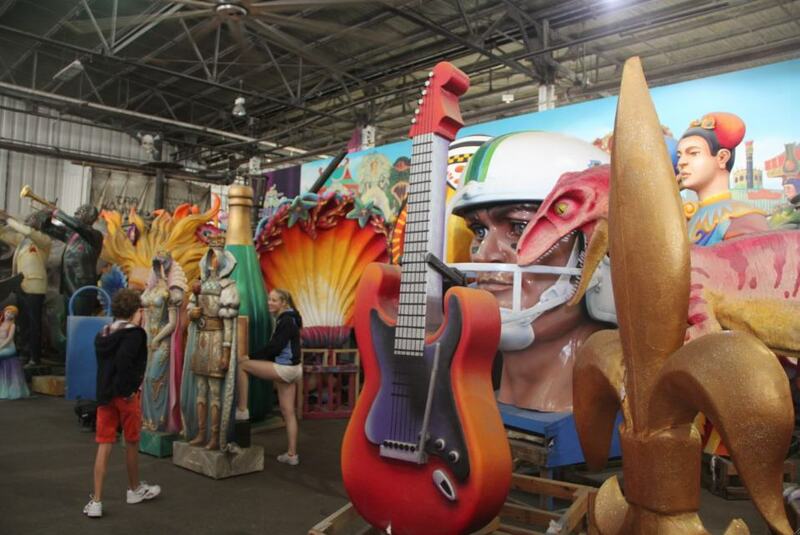 Every year it’s decorated according to the krewe’s new theme, and each year’s decoration will cost another $6-10,000. $1-2,000 will be spent on throwaways: the trinkets thrown from the floats to the crowd. The money for this extravagance comes from members’ annual fees ($400-1,500 each) and fundraising events. In addition, members will pay to attend their krewe’s Mardi Gras ball, and they’ll pay for their parade costumes. All for the privilege of standing on a carnival float for a few hours on one day of the year. Row upon row of props. 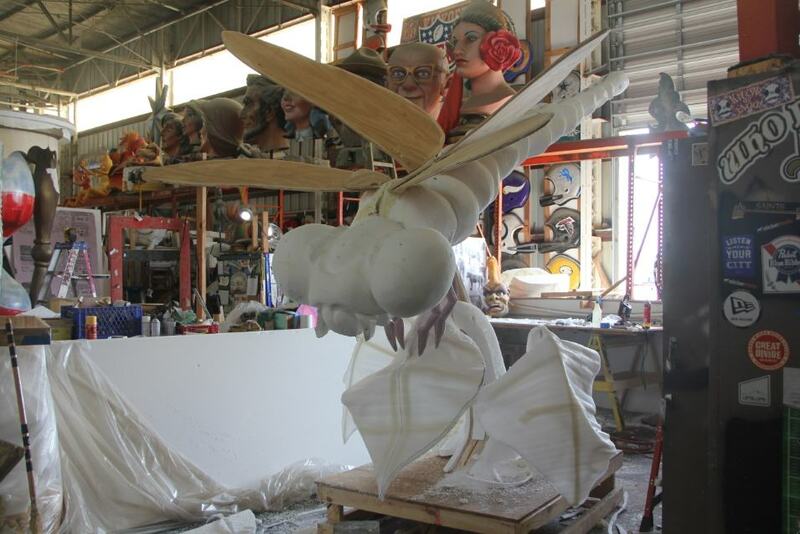 Props are the characters that sit on a float. They’re not part of the float itself. 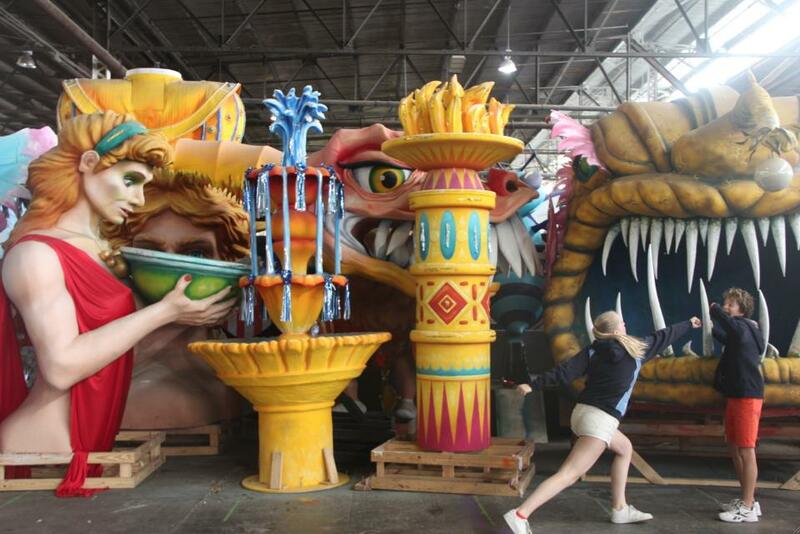 The props are owned by the Mardi Gras workshop, not the krewe. 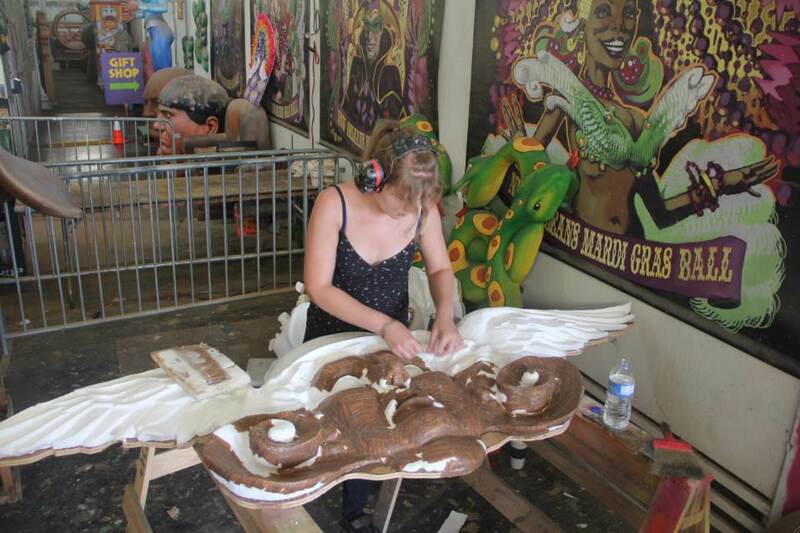 This means that the designers can re-work props from the workshop’s inventory and turn them into new props for another krewe’s float. Mardi Gras lasts for 12 days, not just Fat Tuesday. The biggest days are the weekend before Fat Tuesday itself. Yet each float goes out just once in those 12 days. 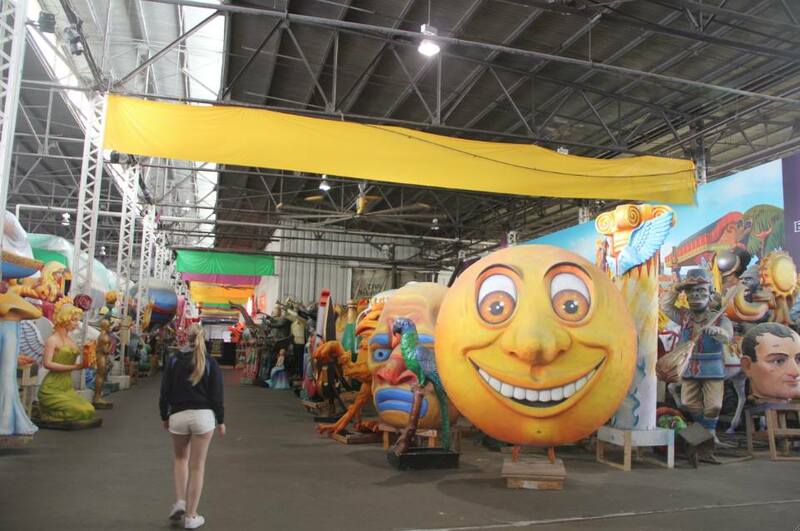 The workshop we toured builds parades for 22 of the 50 krewes that feature in Mardi Gras. It also provides 130 tractors to pull the floats, and stores the floats from year to year in its 18 warehouses. The huge warehouse we saw was 250,000 sq ft. The revenue brought into the New Orleans metro area for Mardi Gras – through the cost of parades, costumes, throwaways and tourism – is thought to be $1 billion each year! I have mixed feelings about this degree of extravagance. Millions of hours of effort and millions of dollars of resources go into designing and producing float decorations that will last just a few hours. And then be thrown away. That seems terribly wasteful. On the other hand, the Mardi Gras industry provides employment for thousands of people, and communities for many more. Each parade has a band, dancers and performers that will practise throughout the year. There are fundraising parties where people can get together with their tribes. Hanging out with your friends? Priceless. … and painted according to a krewe’s theme. You don’t know what creatures you might meet in a Mardi Gras workshop.